Do you despair of the amount of time your children spend in front of the television? Are the constant demands for the latest playstation games your biggest headache? If these problems sound familiar then what you need are Smurfs! Smurfs are friends to children and grown-ups alike. At Kitty's Cavern Smurf Shop we specialise in the pvc 2 inch figurines that first appeared in the UK in the National Garage petrol promotions in the late 1970's and which are still being produced today by Schleich, a company based in Germany. Many children of the 1970s loved their smurfs so much that they resumed their smurf collecting as adults, the number of smurf collectors in the UK is growing rapidly. 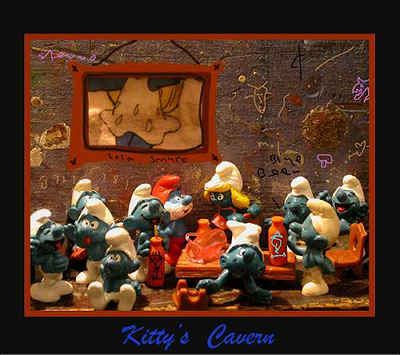 Collectors particularly enjoy making Smurfy Scenes, the one below was put together by the Canadian Artist, Attom. If you ask someone if they remember the Smurfs you will be surprised how many people still have a collection tucked away in their attic! The quality of Schleich's products is such that these toys will stand the test of time. If kept in good condition they will become more valuable, whereas most toys today often end their days in the rubbish bin, and you are left disheartened at the waste of your hard earned cash. Smurfs encourage imaginative play; they promote role-playing with Papa Smurf, Smurfette and Baby Smurf being the key characters. There are many Smurfs relative to more modern interests such as Scuba-Diving Smurf, Hip-Hop Smurf and even Workaholic Smurf with his laptop. If you are looking for a new hobby which both you and your child can enjoy, and you were once a fan of the Smurfs, then why not rekindle that interest and share it with your child? You will have the added satisfaction of knowing that if looked after properly any Smurfs, Super Smurfs, Smurf Playsets and Smurf Buildings will only increase in value as time goes by. Simply remember, a Smurf is for life, not just for Christmas.